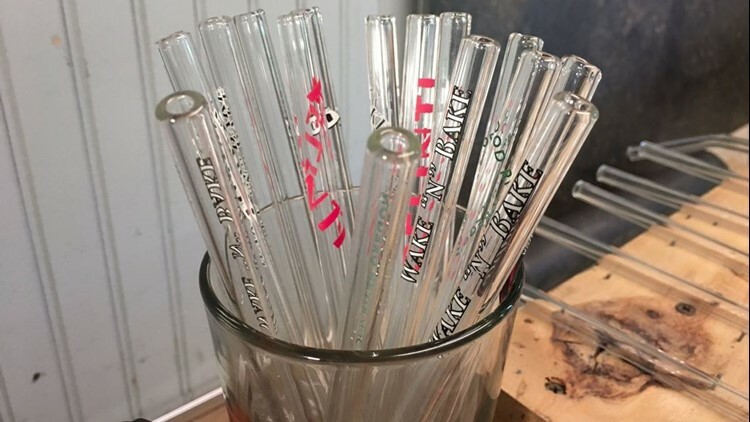 A family-run business in Hood River that makes glass straws is seeing a boom as more restaurants stop using plastic straws. HOOD RIVER, Ore. – As cities move toward banning plastic straws, a family-run business in Hood River is booming. Seattle’s ban on plastic straws goes into effect on July 1. Portland is discussing a ban as well. The move is not only good news for the environment, it's also good news for Ecoglass Straws in Hood River. The family-owned business began making glass straws more than a decade ago, but the idea is just now catching on. "Most people have never even heard of a glass straw or even seen one,” explained Ecoglass Straws founder Craig Graffius. Graffius started making stained glass about 30 years ago. He said it was actually his wife who came up with the idea to make straws. “She said you have all this glass all over the place, why don't you try a straw,” Graffius said. Graffius said business is starting to pick up with the move toward banning plastic. “We never expected this,” he said. He thinks people are just now realizing how bad plastic straws are for the environment. “Everybody's understanding, you know, I'm not just going to throw this plastic thing away in the trash and it's going to go in the landfill. I'm going to put it back in the dishwasher and re-use it over and over and over,” Graffius said. The glass straws are reusable, as well as dishwasher and microwave safe. With only four employees, the business can make about 1,000 straws a day. However, with increased demand, they are currently building a new machine that will allow them to make about 2,000 straws an hour. Some businesses in Hood River have already made the switch to glass. Graffius said they are now getting calls from bigger corporations like McDonald’s and Pepsi. The glass straws come in a few different sizes and can be ordered online.